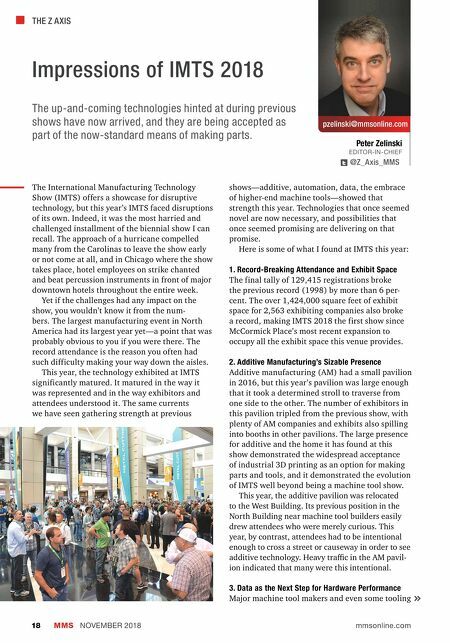 THE Z AXIS MMS NOVEMBER 2018 18 mmsonline.com pzelinski@mmsonline.com Peter Zelinski EDITOR-IN-CHIEF @Z_Axis_MMS Impressions of IMTS 2018 The International Manufacturing Technology Show (IMTS) offers a showcase for disruptive technology, but this year's IMTS faced disruptions of its own. Indeed, it was the most harried and challenged installment of the biennial show I can recall. The approach of a hurricane compelled many from the Carolinas to leave the show early or not come at all, and in Chicago where the show takes place, hotel employees on strike chanted and beat percussion instruments in front of major downtown hotels throughout the entire week. Yet if the challenges had any impact on the show, you wouldn't know it from the num- bers. The largest manufacturing event in North America had its largest year yet—a point that was probably obvious to you if you were there. The record attendance is the reason you often had such difficulty making your way down the aisles. This year, the technology exhibited at IMTS significantly matured. It matured in the way it was represented and in the way exhibitors and attendees understood it. The same currents we have seen gathering strength at previous shows—additive, automation, data, the embrace of higher-end machine tools—showed that strength this year. Technologies that once seemed novel are now necessary, and possibilities that once seemed promising are delivering on that promise. Here is some of what I found at IMTS this year: 1. Record-Breaking Attendance and Exhibit Space The final tally of 129,415 registrations broke the previous record (1998) by more than 6 per- cent. The over 1,424,000 square feet of exhibit space for 2,563 exhibiting companies also broke a record, making IMTS 2018 the first show since McCormick Place's most recent expansion to occupy all the exhibit space this venue provides. 2. Additive Manufacturing's Sizable Presence Additive manufacturing (AM) had a small pavilion in 2016, but this year's pavilion was large enough that it took a determined stroll to traverse from one side to the other. The number of exhibitors in this pavilion tripled from the previous show, with plenty of AM companies and exhibits also spilling into booths in other pavilions. The large presence for additive and the home it has found at this show demonstrated the widespread acceptance of industrial 3D printing as an option for making parts and tools, and it demonstrated the evolution of IMTS well beyond being a machine tool show. This year, the additive pavilion was relocated to the West Building. Its previous position in the North Building near machine tool builders easily drew attendees who were merely curious. This year, by contrast, attendees had to be intentional enough to cross a street or causeway in order to see additive technology. Heavy traffic in the AM pavil- ion indicated that many were this intentional. 3. 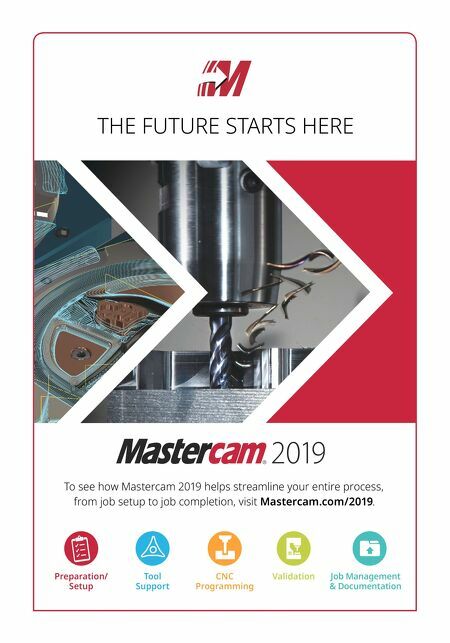 Data as the Next Step for Hardware Performance Major machine tool makers and even some tooling The up-and-coming technologies hinted at during previous shows have now arrived, and they are being accepted as part of the now-standard means of making parts.